The new Democratic-led House is planning multiple investigations into the Trump administration, including a laser-like focus on the $50-billion annual budget of the Homeland Security department, which oversees Donald Trump’s controversial immigration policy. It may be hard to pin down a date for DHS secretary Kirstjen Nielsen to testify before the new Democratic majority, which will be seated Jan. 3. Looks like she’s getting out of town for a long spell quite soon. Thursday, Nielsen is scheduled to make a rare appearance in front of the House Judiciary Committee‚ still led by Republicans. The committee, tasked with vetting the legality of DHS actions, had not held a single hearing on the topic in years, even as the Trump administration’s family-separation policy kicked in this summer, tearing hundreds of kids from their parents at the southern US border. Nielsen was supposed to testify earlier this month but postponed, and Democrats’ earlier request that she testify before the Oversight Committee was ignored by its outgoing Republican chairman. Nielsen worked briefly as the chief of staff for John Kelly when the retired marine general was secretary of DHS, and then as an aide when Kelly became White House chief of staff. She was nominated to run DHS in October 2017, a controversial choice because of her lack of experience in running a big agency. Her tenure has been rocky. As the face of harsh anti-immigrant policies, Nielsen has been booed in restaurants and protested at work and home. Yet Trump seems to feel she isn’t doing enough to drive asylum seekers away from the US, and has been threatening to fire her since May. 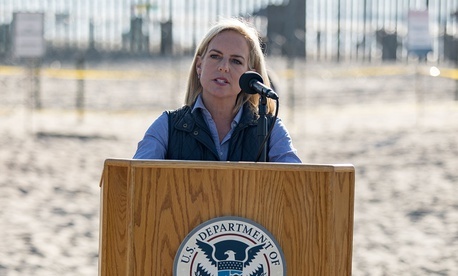 Kelly was Nielsen’s staunchest supporter in the administration, staving off several attempts to fire her as Trump blamed her for not being able to convince Congress to fund a border wall with Mexico. Kelly’s long-anticipated departure, announced Dec. 8, is expected to mean Nielsen will leave soon afterward. Her exit wouldn’t stop the new Democratic Congress from forcing her to testify (see James Comey, for example). The House Oversight Committee has subpoena authority and is already planning a series of probes into Trump agencies. The House Homeland Security committee also plans to question DHS officials, including Nielsen. Congress could call Nielsen to testify to investigate whether the agency has established a pattern of twisting the facts and hiding information, said Ur Jaddou, director of DHS Watch, an immigration-policy watchdog, and former chief counsel for the US Citizenship and Immigration Service. House committees are also likely to investigate the family-separation policy; Nielsen herself appears to have signed a memo that approved of the policy that has led to thousands of children being separated from parents, some for months at a time. She also was behind a directive that banned the top US immigration experts from testifying this year.